By the end of the 19th century, white steam laundry operators intensified their efforts to destroy all Chinese laundries. This goal is illustrated in several examples of the use of advertising that directly attacked the Chinese laundries. 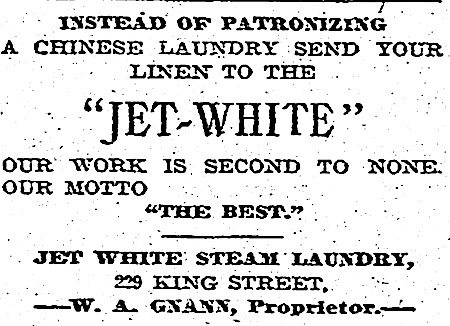 The above 1907 advertisement for Jet White Steam Laundry in Charleston, South Carolina, simply urges the avoidance of Chinese laundry in favor of the Jet White laundry which claims to be “the Best.” It was a direct appeal, but avoided the extreme negativity of the 1915 Dothan, Alabama advertisement below. This no holds barred ad used images depicting Chinese laundrymen smoking opium at the top of the ad and sleeping and eating in the laundry in the bottom of the ad. In between these images, the text poses questions about whether customers want to have their laundry done in a Chinese laundry where eating and sleeping occurs in the same room as the clothes washing is done. The issue changes from the physical features of the Chinese laundry to the concern that the Chinese send most of the money they earn back to China rather than spending it locally. 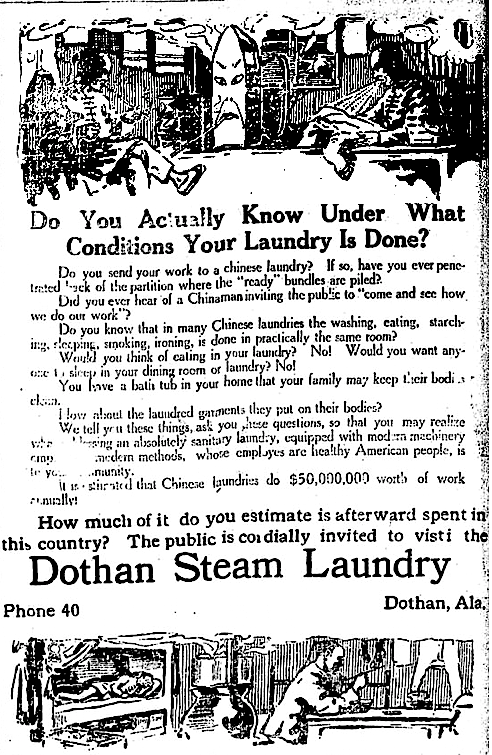 Finally, following up the point raised early in the ad about the Chinese never inviting customers to see the interior space of their laundries behind the front partition, the public is cordially invited to visit the Dothan Steam Laundry. In Washington, D. C., the Yale Steam Laundry ran two ads, one in 1897 and a different one in 1907 poking fun at Chinese laundries. An interesting sidenote is the fate of the Yale Steam Laundry. It was very successful for many decades but finally closed in 1976. The laundry building was saved and converted into upscale condominiums. The building is listed on the National Register of Historical Places.